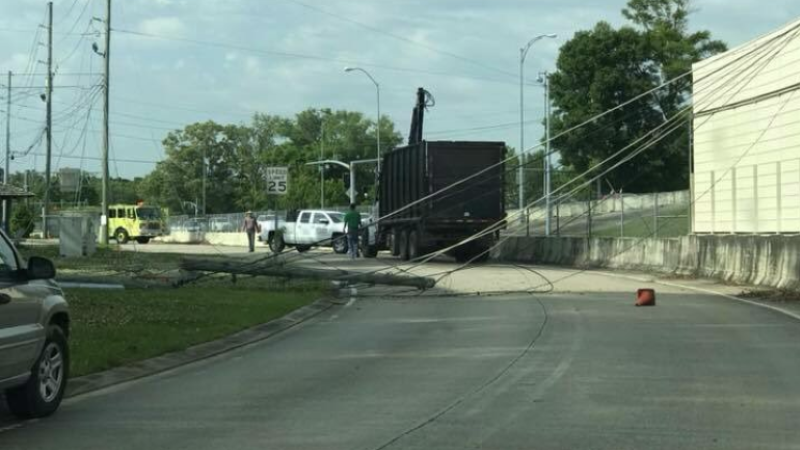 BATON ROUGE – A tree-trimming truck became tangled in utility poles, causing utility lines to fall across I-12 Friday morning. The lines blocked travel lanes in both directions and resulted in a morning-long closure of the busy highway system. A picture shared with WBRZ showed the truck headed toward Essen on Quarters Lake Road and appeared to stop just after pulling the lines down. According to the East Baton Rouge Sheriff's Office, the driver worked for Arbortech Tree Services and had failed to lower the truck's boom. The sheriff's office says the trucks extension caught on the power lines and pulled them down, causing a crash on I-12 and shutting down the interstate. The driver of the truck has been cited for careless operation and for the hours-long hazard clean-up. Authorities said the truck pulled between 20 and 30 lines down. The situation caused a mess on surface streets and both interstates 10 and 12. When the lines fell, two vehicles that were traveling westbound on I-12 were involved in a crash with the lines. There was minor damage to both vehicles and one driver sought medical attention on their own as a precaution, authorities told WBRZ. Traffic was moved off I-12 West at Airline Highway and eastbound traffic was diverted onto I-10, not allowed to head east at all on I-12. Traffic from Livingston Parish was congested nearly to the parish line and the Amite River; Eastbound traffic stretched to La. 415. I-12 reopened around 1 o'clock. Click HERE to monitor traffic conditions, live, through WBRZ's advanced traffic-tracking technology and map software. Police said the best plan of action was to leave planning to the utility companies and not just simply cut the lines and pull them off the interstate. It was not immediately clear if the lines were a mixture of power lines and fiber optic cable, which could also provide data, internet, cable and phone service to thousands of people. Police were manning intersections and manually adjusting traffic signals on surface streets.